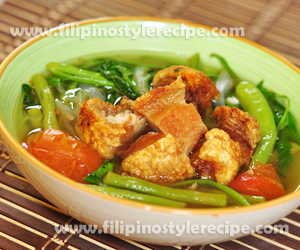 Filipino Style Recipe: Sinigang na Bagnet is another variety of Filipino tamarind soup using bagnet as main ingredient. Bagnet is a popular delicacy in Ilocos made from pork belly deep fried until crispy and blister on skin. This dish has a sour taste best to serve during rainy and cold season. 1. In a casserole, pour pork broth, onion, tomatoes then bring to boil. 2. Add tamarind juice then bring to boil. Add gabi then simmer until tender. 3. Add radish, okra, green pepper, and string beans then simmer for another 5 minutes. 4. Adjust seasoning with fish sauce then add bagnet and kangkong. 5. Turn off the heat then let it sit for 1-2 minutes or until kangkong is cooked. 6. Transfer to serving bowl then serve hot with steamed rice. 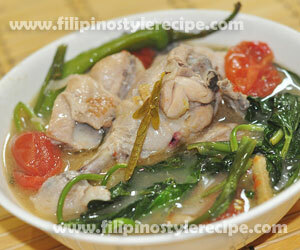 Filipino Style Recipe: sinampalukang manok or chicken in tamarind is another simple and easy Filipino dish. 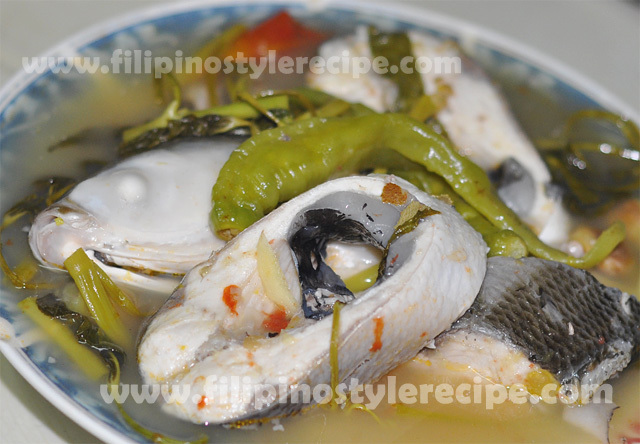 This is similar to sinigang na hipon and sinigang na baboy. Normally the chicken sauteed and cooked in a combination of onions, garlic, ginger, different vegetables and tamarind which gives a sour taste. In a pot, boil tamarind until soften then pound and extract the juice. Set aside. 1. In a pot, heat oil and saute garlic, onions and ginger. 2. Add chicken and pour fish sauce then continue sauteing until chicken is light brown. 4. Add tamarind leaves and tamarind juice then simmer for 5 minutes over low heat. 5. Add eggplant, string beans and green chili. Simmer of 5 minutes. 6. Adjust seasoning with fish sauce or salt and pepper. 7. Turn off the heat, add water spinach and cover for a few minutes. 8. Transfer to serving bowl and serve with steamed rice. Enjoy! 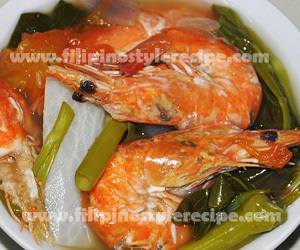 Filipino Style Recipe: sinigang na hipon is another simple and easy Filipino dish. 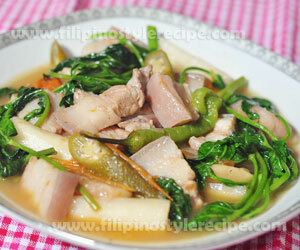 This is similar to sinigang na baboy. Normally the shrimps cooked in a combination of onions, tomatoes, different vegetables and tamarind which gives a sour taste. 1. In a pot, pour water and bring to boil. 2. Add onions, tomatoes and radish. 3. 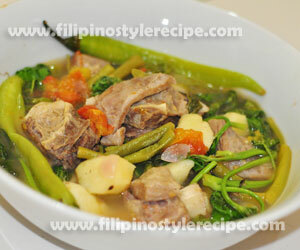 Add sinigang mix and simmer for 2 minutes. 4. Add shrimps, string beans and green chili then simmer for 3 minutes. 5. Adjust seasoning with salt or fish sauce. 6. Turn off the heat, add water spinach and cover for a few minutes. 7. Transfer to serving bowl and serve with steamed rice. Enjoy! 1. You may also add eggplants or pechay.